MCCC Gallery Exhibit, ‘Saturated Geometry,’ Features Works by Five Artists Jan. 28 to Mar. 7; Community Reception Feb. 6, 5 p.m.
West Windsor, N.J. – The Gallery at Mercer County Community College (MCCC) will showcase works by five artists in its upcoming group exhibit "Saturated Geometry." The show runs from Monday, Jan. 28 to Thursday, Mar. 7. The community is invited to a reception on Wednesday, Feb. 6 from 5 to 7:30 p.m. Featured artists include Robert Erickson, Ryan Sarah Murphy, Alex Paik, Richard Tinkler, and Andrew Zimmerman, all of whom are based in New York. The artists will present talks preceding the community reception on Wednesday, Feb. 6 at noon in CM110. 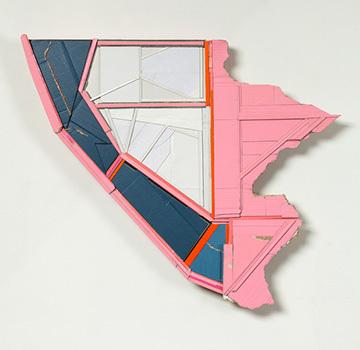 According to Lucas Kelly, the show’s curator, the works of these artists offer their interpretations of formal geometric abstraction and color. “These works may utilize topics such as architecture, structure of musical composition, or process to create pieces that are both formally and conceptually saturated in some way,” Kelly said. For updates, directions and other information, visit www.mccc.edu/gallery or www.facebook.com/MCCCgallery..